May be we do not have any link with Indian Sikhs as we have no direct relationship with them. However, by way of humanity, it is our duty to raise voice in opposition to Indian atrocities against its minorities as we do in case of Muslims of India in general and those of Kashmir in particular. There is another reason for this that Sikhs have confessed their historic role in Punjabi holocaust in 1947’s partition under the influence of Hindu leadership and they have always raised voice against Indian policy of Muslim genocide beside their support for freedom movement in Indian held Kashmir. 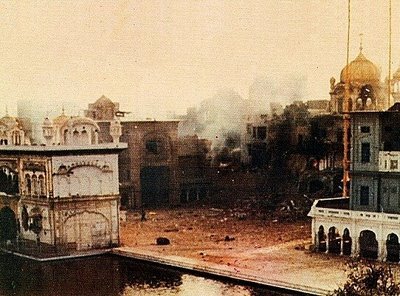 June have passed but no TV channel or any newspaper has expressed solidarity with Indian Sikhs and condemned Indian government for its attack on Sikh’s central religious site “Golden Temple” in 1984. We celebrate many days from Valentine to Father’s Day, no matter these are related to our culture or not. News about Indian singers, actors and actresses are broadcasted many times. TV channels endeavor to broadcast India friendly news so that its image is softened more in the perception of the world. However, Nawa-i-Waqt, as usual, fulfilled its journalistic duty and printed a four columned news citing Human Rights Watch, “Indian government and courts must serve justice to those involved in massacre of Sikhs”. I am sure our new generation and readers do not know what was Operation BLUE STAR and on whose authority Indian army attacked Sikh’s Golden Temple with tanks; Why Indra Gandhi (so called mother of democracy), adopted a dictatorial approach to Sikh Issue; and why world community neglected this fascism as in case of 1971. At last she met her end at the hands of her two loyal Sikh guards on 31 October 1984. To avenge this, notable congress leaders supervised massacre of Sikhs for four days and performed a symbolic bath by rubbing Sikh blood against their bodies. It is not only part of history but a proof as well that India is fascist despite its claims of secularism and democracy. Why Sikhs want separation from India? What was Khalistan Movement? It is quite a long story, however, organized massacre of Sikhs in 1984 is enough for eye opening. In 1982, when Sikh political leader Jarnail Singh Bhandranwala felt that he has unnerved Indian Prime Minister Indra Gandhi and established himself in “Guru Nanak’s Niwas” attached to golden temple and started reaching out to world at large through international media and reporters. He knew well that Sikh's religious leadership is not yet ready for separation and Indian local media does not have courage to stand against Indra Gandhi. On 23 April 1983, DIG of East Punjab Police, A K Atwal was assassinated by RAW when he was leaving Golden Temple after meeting President of Akaal Dal, Harchand Singh Langwal. Langwal blamed Bhindranwala for this murder in order to cleat himself. Indra Gandhi made intelligent moves and religious leadership of Sikhs started pressurizing Bhindranwala to vacate Guru Nanak Niwas. 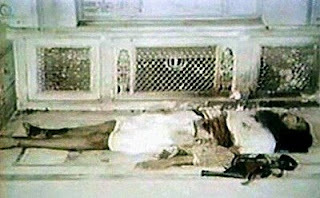 On 15 December 1983, supporters of Peer Khalsa and Langwal tried to force him out but he entered into Golden Temple along with his loyal followers. Indra Gandhi Government was not prepared for this because Sikh guards of golden temple supported Bhindranwala. Government thought that it would be easy to tackle Bhindranwala outside Guru Nanak Niwas. However, his entry into Golden Temple strengthened his position. Sikh youth started paying attention to his idea of separation. 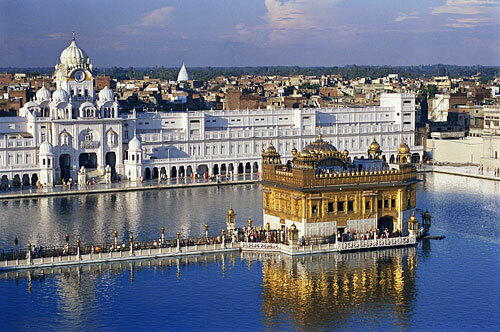 Golden Temple proved to be Bhindranwala’s stronghold and headquarter. At this time, Indra Gandhi decided to eliminate Bhindranwala and his followers because he was being called as Jarnail or General. On 1st February 1984, Indian intelligence agency RAW forced newspapers to broadcast news that Bhindranwala has prepared a motorcycle borne armed group that would target Hindus in Amritsar. Not only Amritsar but other major cities also came under grip of fear due to this news. Bhindranwala declared such a scheme a conspiracy of Hindus and Congress against Sikhs. However, this explanation could not find any place in Indian media. After taking the decision for operation in Golden Temple, Indra Gandhi asked Indian Army Vice Chief General S K Sinha to work out timings and details of the operation. He was promised the post of Chief of Army Staff after this operation. But he advised her to solve the problem through dialogue. She dismissed him immediately violating all military norms. 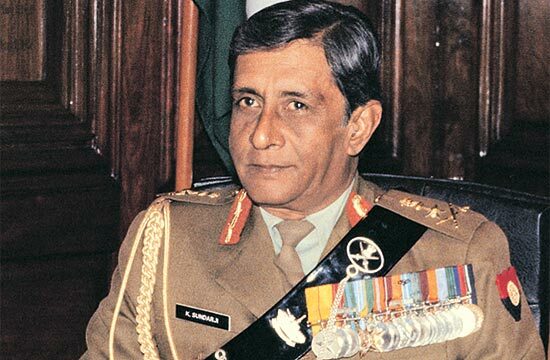 General Arun Shridhar Vadhya was promoted as army chief in his place and was ordered to eliminate Bhindranwala no matter Golden Temple is destroyed in the process. He promised the operation and asked Indra Gandhi to promote General Sunderji as Vice Chief that was agreed. On the night of 1st June both the General officers arrived in Amritsar. The whole province was placed under curfew for 36 hours and all communication links including telephone and electricity were disrupted. In other words, the province came under martial law by the order of Prime Minister Indra Gandhi. Media was warned before hand not to broadcast any news against wishes of the government otherwise media owners and reporters would not be spared. The whole province of Indian Punjab was cut off from rest of the world. On night of 5th June, Indian Army under the command of Major General Kuldeep Singh Barar assaulted Golden Temple. Followers of Bhindranwala offered stiff resistance but could not withstand for long against artillery guns and tanks. All seventeen houses were demolished by cannons with in one and half hour. Contrary to that only front five houses were being used by followers of Bhindranwala. Shabak Singh, Leader of front line defense of Bhindranwala was killed along with his other fighters. An exact figure of casualties has not been declared so far because Indian Army frisked away hundreds of dead bodies including those innocent Sikh devotees who were caught in the fire. These also included women and children. Many of these devotees had come from Europe. 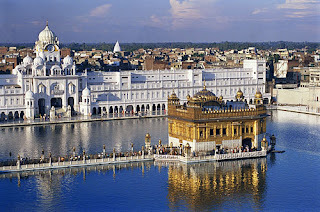 In second stage, Indian Army entered the Golden Temple. 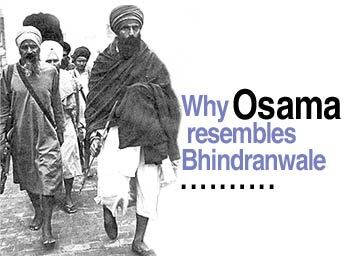 Bhindranwala and his followers were armed with small arms including machine guns. They fought the Indian Army bravely. At one time General Barar hesitated targeting Akal Takht in middle of pond. However he had example of General Sinha in his mind and ordered the Army to attack Akal Takht. Bhindranwala and his follower had taken refuge in Akal Takht and were engaging Indian Army with machine guns. Some armored vehicles were also destroyed by rocket launchers. Tanks were brought forward. Two tanks entered the Golden Temple. The Akal Takht was engaged with tank fire. The whole building was destroyed before sunrise. As per Indian Army’s claims, 4 officers, 4 junior commissioned officers and 75 soldiers were killed. 13 officers, 16 junior commissioned officers and 220 soldiers were injured. If 83 all ranks of an army supported by tanks and armored vehicles were killed in a night than you can imagine how many Sikhs would have been fighting against them. As per Indian Army, Bhindranwala with his 59 followers was killed along with 492 Sikh civilians. More than 4000 Sikhs were killed as per independent sources. Some of these were killed in Golden Temple. 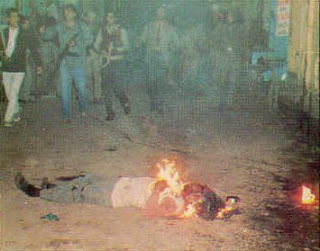 Others Sikh youth were killed by Indian Army on a mere suspicion accusing them as supporters of Bhindranwala. These were killed in cold blood with out any proof or judicial proceedings. Thousands of Sikhs were killed. Operation BLUE STAR met with success and calmed dictatorial instincts of Indra Gandhi. One of her political opponent was eliminated. Human right organizations chose to remain silent. International media only broadcast the news for information. No one condemned or protested against this. After 148 days, on 31 October 1984, Indra Gandhi was killed by her own guards walking from her government residence to offices. The news spread like a wild fire that Sikh guards had avenged killing of Bhindranwala. Sikh were attacked by Hindus in all major cities including New Delhi. For four days, Sikh were attacked and killed in the streets. 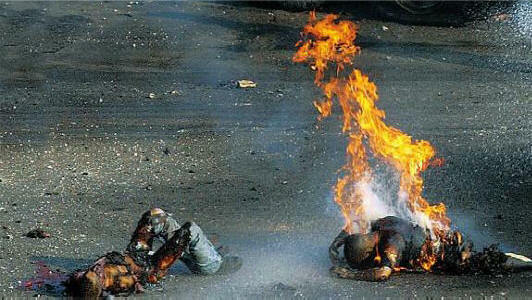 On the 31st, every Sikh on streets was killed and burnt. Even babies and aged people were not spared. However, form 1st to 4th November, Sikh population and business centers were targeted in an organized manner. Parliamentarians were seen supervising such attacks. Congress government even freed professional criminal from jails on the condition that they will kill maximum Sikhs. Hindu extremists committed acts of violence against uniformed Sikh Police officers while their other comrades kept looking at it. All Sikhs in police and army were disarmed beforehand. As per proofs presented in Indian courts, congress parliamentarians and leaders called their supporters on special meetings handed over weapons, petrol and money for the ugly job. List of Sikh residents were prepared through voter lists, children enrolled in government schools, ration cards, registers of trade unions and records of income tax. These lists were distributed as an electoral roll and groups were organized area wise for attack on Sikh population. This whole planning was completed before 1st November. (it must be remembered that same techniques are adopted against Muslims in India). On 2nd November, the riot hit cities were placed under curfew, but not for these Hindu extremists, rather for those unfortunate Sikhs who were trying to escape the violence. On 4th November, when storm of revenge was over, the so called secular leaders of Congress apologized for Sikh holocaust and assured no further killings. They asked Sikhs to forget what had happened and move forward as they have to live together with the Hindus. As per Indian estimates, 20,000 Sikhs were killed in these riots and 80,000 were displaced. A judicial commission was also organized to investigate these killings. This judicial commission has created so far eleven more commissions but with no results. However, a US based NGO named “SIKHS FORJUSTICE” has filed a case against Indian Congress, now in government, in a New York court for carrying out organized massacre of Sikhs in India. US court has asked Indian Congress and its leader Kaml Nath to appear in the court. 4000 innocent sikhs killed because Army command failure. 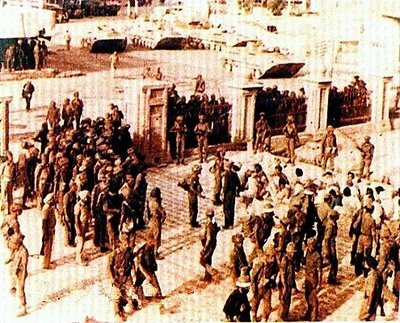 Operation blue star was only given 2 days to capture golden temple but it took 8 days. To save army from shame that 250 singhs halted 125000 heavy army for 8 days.